One of the interesting aspects of feminism is the creation of opportunities for women in spaces that have been considered exclusive to men. One of those spaces is Sports Journalism and across America today, there are women who are enjoying a successful career as sportscasters or reporters. Among them is Liz Habib, a sportscaster who has been in the business for over two decades. Since she began her career, Liz Habib has worked for a couple of television networks and has earned a couple of awards to her name. She has also been able to overcome some of the persisting challenges for women in her field, by maintaining a successful marital relationship. Join us as we take a deep look into the life of Liz Habib in this article and you are bound to learn a lot. Read on. The life of Liz Habib began on the 1st of August, 1967 when she was born in Pittsburgh, Pennsylvania. Although born in America which makes her an American by law, Liz Habib is ethnically a Lebanese-American having been born to parents who are. Habib grew up in a large family with seven siblings which consisted of an amazing six brothers with a solitary sister. Perhaps it was the sheer amount of male presence in the home or her father’s background experience as a collegiate swimmer, but Liz grew up with a huge interest in sports and this informed her choice of study in higher education. Having graduated from St. Francis Academy in Pittsburgh, she joined the University of Pittsburgh, studying journalism and English and later graduating with a bachelor’s degree. Following graduation, she began her professional life as a journalist with KTVK in Phoenix, where she worked as a news anchor. Then, at WKYC, a television channel based in Cleveland, where she also worked as an anchor but also as a reporter. Her early professional days also saw her work for WTOV in Steubenville as an anchor. 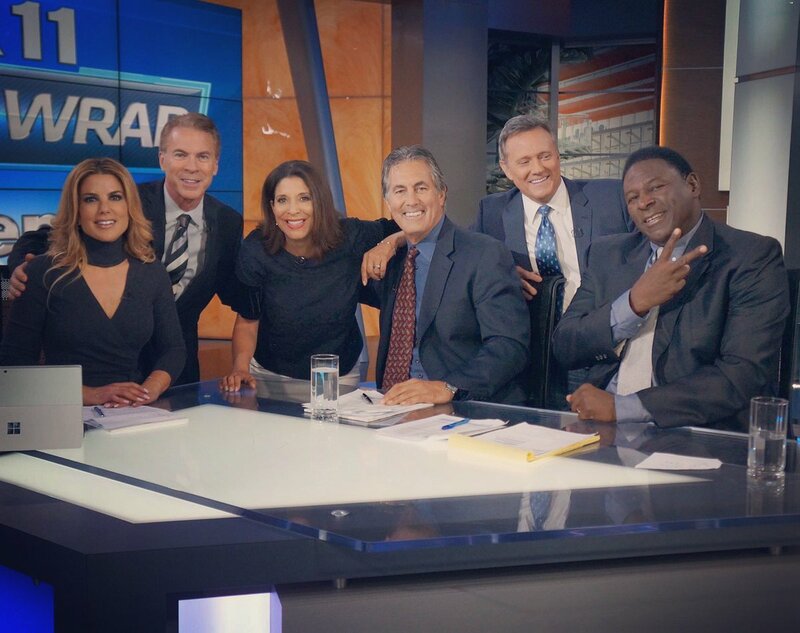 The journeyman life at the beginning of her professional career eventually led her to KTTV Fox, where she has remained as a sports anchor since 2005. She has worked on several shows, including the Fox 11 Overtime NFL, Fox 11 Extra Inning and post-game college shows. Her work as a sports journalist for the channel also includes being a reporter for the Los Angeles Dodgers and the Los Angeles Angels. She has developed an extensive experience across Los Angeles sports, which not only covers baseball but also basketball via the LA Lakers and Clippers, and hockey via LA Kings and Anaheim Ducks and in soccer via LA Galaxy. Her extensive coverage and knowledge of sports in Los Angeles for Fox 11 has earned her multiple awards, including two Emmy awards for her professionalism and her excellent reporting. Outside of professional sports reporting, Liz Habib has also extended her coverage to college sports, reporting on college teams in the University of Southern California and the University of California, Los Angeles. Is She Married, Who is Her Husband? The jet setting life of the average sports journalist has made it challenging for women who are still mostly considered to hold the responsibility of being primary caregivers to maintain both a successful professional career and a thriving personal relationship. Liz Habib, however, has been able to hack the system and has been married to Charlie Whittaker since October 20, 2012. The couple, understanding their responsibilities to each other and the commitments of their profession, particularly that of Liz, choose to split their time between Los Angeles and Orange County. They do not have any children but instead have two dogs – Teddy and Wiley. Liz Habib has a seemingly short physique and that has been confirmed by her listed height which is considered to be 5 feet 3 inches. Considering her work as a sportscaster, it goes without saying that fitness is a necessity in her profession and she has been able to maintain a good figure through regular gym exercises, evidence of which she regularly posts on her Instagram page. Another body profile worth learning is that she has blonde hair, with a slim bodybuild and brown eyes. 1. She has made appearances on Fox News and CNN as a contributor. 3. Liz Habib has also maintained a close relationship with her cultural background, participating in events organized for Lebanese-Americans.